Discount Parking is available near the Lowman Building Apartments. Web coupons offering special discounted parking rates are available for each of the parking locations listed above. Select the location of your choice to view parking information and print the web coupon. You must present the coupon to receive the special discounted rates, so be sure to bring one with you. 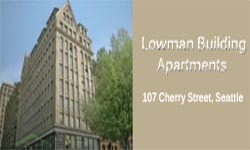 The Lowman Building Apartments are conveniently located near the Seattle Aqaurium, Waterfront Park, the Washington State Ferry Terminal, Bill Speidel's Seattle Underground Tour, the historic Pioneer Square district, and many choices for fine dining.